Everybody wants to look their best no matter what season it is. In winter 2018, one trend that everyone will surely want to pull off is the parka jacket. It is stylish, classic and trendy at the same time. While wearing a parka in 2018, you will not only look stylish during this cold season, but you can also keep warm in the jacket. If you have your knee-high fashion boots, you can pair it with a pair of leather pants and a swaggy sweater. On top of that, add your parka. Winter is all about keeping warm, but that doesn’t have to derail your fashion sense. You can zip up your parka halfway or not zip it up at all. Many celebrities have pulled off this look — since Kira Mazura did in 2011– and it has looked amazing on them. Do you want a laid back, casual look to go with your parka? Well, you can rock a pair of jeans, a t-shirt couples with sneakers and a parka. This look can make you look flashy and trendy. In this look, you can fully zip up as you want to remain warm and only show off the jeans, sneakers and parka. With the parka, most girls may fear to rock their short boots, but they shouldn’t. You can work it and look every bit trendy. You just need to find the perfect match. A furry hooded parka paired with black trousers, black boots and a black t-shirt will not only keep you warm but also looking trendy. 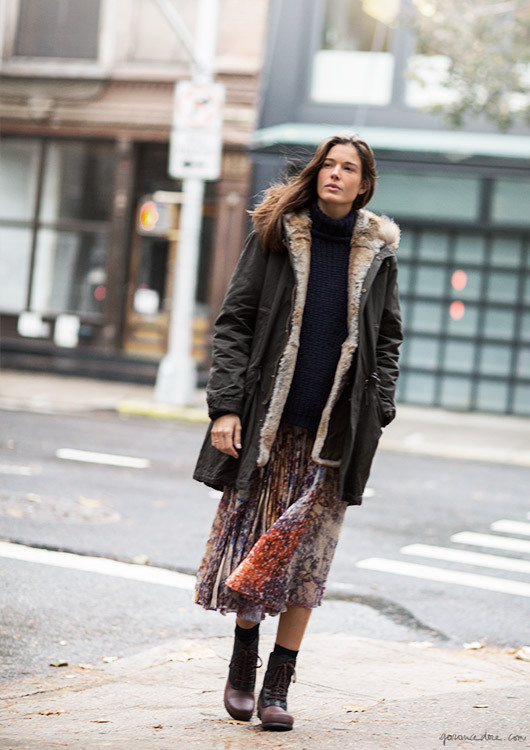 One of the most feared ideas today is that you can wear parkas with skirts. Well, that fear is unfounded. Kelly Flos once managed to pull off an oversized linen cocoon parka with a below-the-knee skirt, and it looked amazing. The shoes that were involved in this look, in case you were wondering are wedges. Paired with a hat and some little accessories, the look was just great. It also looked warm enough. A blend of style and substance was Rihana’s style when she pulled off an oversized furry parka, ragged jeans and a pair of Timberland boots, which screams out confidence. Wearing a light sweater on the inside and an open zip parka will make you stand out this season. Parkas have become a worth-while investment for most of over the years. They not only make you look stylish but also keep warm. Therefore, it will be one of the fashion options for you in winter. Rock them by following our tips, and you will look fashionable, too, For more trendy parkas, please check here.